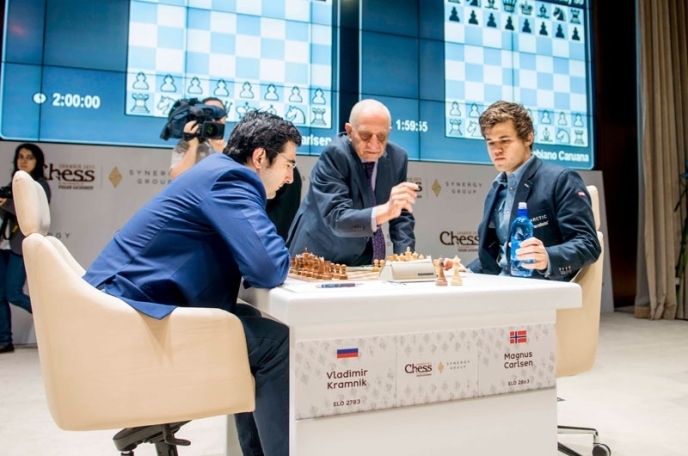 Magnus Carlsen inflicted a third successive defeat on Vladimir Kramnik to take a one point lead into the final two rounds of the 2015 Gashimov Memorial in Shamkir. His hottest pursuer is now the unbeaten Vishy Anand, who scored his second win with a highly creative game against Michael Adams. Wesley So fell to defeat against Fabiano Caruana, but could blow the tournament wide open if he beats Carlsen in Round 8. Dortmund 2014 (yes, the same Dortmund he’s won 10 times!) – 2.5/7, 7th place out of 8, 0 wins, 4 draws, 3 losses. That final -1 result might not seem that disastrous, except that those three losses came in the final four rounds. Starting well and finishing badly has become an issue for Kramnik, with Shamkir a case in point. 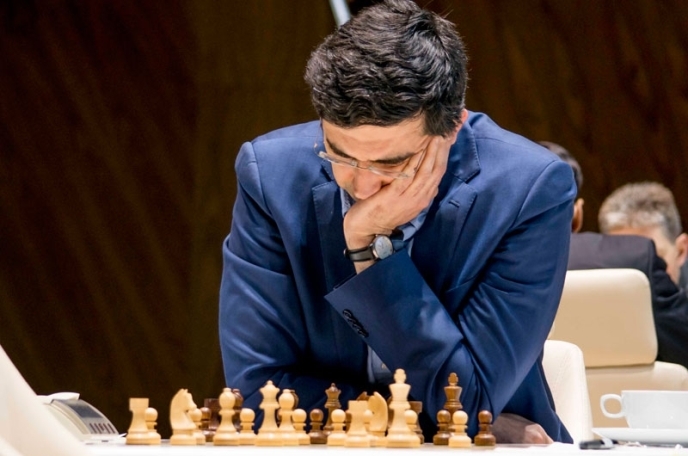 Kramnik won his first game, but has now achieved a first for his long and illustrious career – three classical losses in a row in the same tournament. When you’re on -2 you’re not incredibly motivated to play great chess. It’s clear I’m in very bad form and cannot calculate for some reason, but still I’m a professional. I’ll just try to play normal games. I want to show decent chess, at least in the last two games. Just as in Round 5, we had three wins for the players wielding the white pieces, and yet again one of those wins was for Vishy Anand. 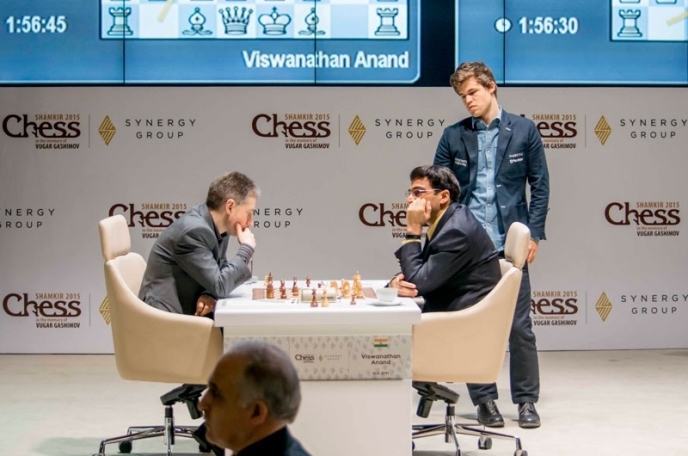 You might expect Anand and Adams to take things easy on each other as fellow veterans, but lately it's been a slugfest. Anand beat Adams in the last round of the London Chess Classic, Adams piled misery on Anand by winning in the last round of the GRENKE Chess Classic and now it was Anand’s turn to take revenge. I’m trying to experiment a little bit and I had some ideas. The problem I felt with 1.c4 today is that Mickey himself has just started playing it, so it’s in his repertoire, but anyway I thought I’d give it a shot. 15.Rxf5!? It worked a charm, as Anand soon inflicted structural weaknesses that he could target, and when Adams slipped with 32…Rd8? (Anand: “maybe the critical blunder in the game”, Adams: “awful”), Anand was able to unleash a small trick he’d seen in advance, with the point being 35.Be6! 50.h6! Kg6 (50…Kxh6 51.Qf6+! picks up the b2-rook) 51.h7! and Mickey resigned, since Qf6+ can’t be avoided whatever Black does (e.g. 51…Kxh7 52.Qf7+ Kh6 53.Qf6+). Vishy is now the only player in striking distance of Carlsen, but he needs some help from Carlsen’s remaining opponents, one of whom, Wesley So, has just lost two of his last three games. 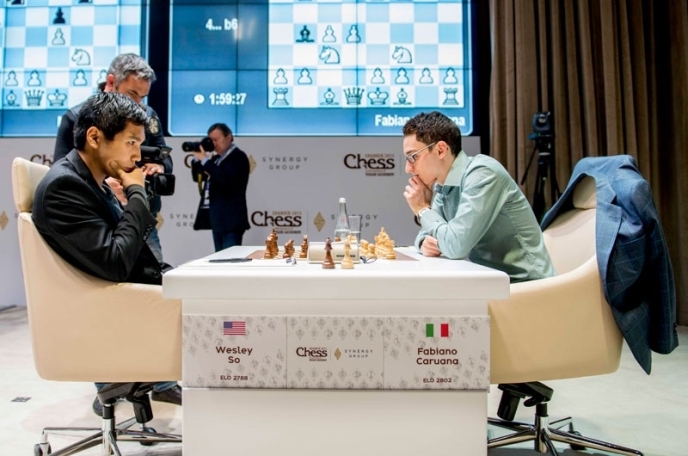 Fabiano Caruana and Wesley So’s tournaments have been mirror images of each other. Wesley had three Whites in the first four games and won all three of them, while Fabiano had three Blacks, which he drew. That would have been fine if he hadn’t also managed to lose the one game with White in utterly unnecessary fashion against the World Champion. So was on fire and Caruana was struggling… Three rounds later, though, Wesley has suffered two losses while Caruana now has two wins in a row and is back up to 2805 on the live rating list! 47.h5! gxh5 48.f5+! Kd6 49.gxh5 and Wesley resigned a couple of moves later. Here he went for the weird and wonderful 21.Bh8?! f6 22.Nh4! but was hit by 22…d2!! and it seems the best either player could do was force a perpetual (but of course don’t take any human’s word for it, just try playing around with Houdini on our broadcast!). Instead 21.Rxe4 Bxe4 22. Qxe4 gxf3 23.Qxf3 is apparently winning for White, but once again, it’s far from obvious. 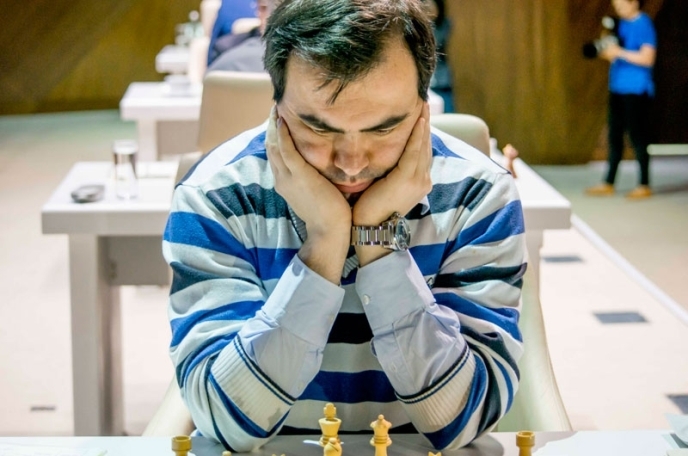 Mamedyarov pointed out afterwards that Mamedov has shown that he has every right to be a participant in the tournament, and indeed he’s now above both Kramnik and Adams. To be honest, from my side it was more ridiculous than anything. I checked this line this morning but still I couldn’t remember any move orders! Innocent girl: Were you afraid before or during the game? Giri: There are some questions to which there are right answers, and the right answer to this question is no! Stop talking during your games. Sit back and don’t calculate, but let the position sink through your mind… But it doesn’t help me to become as good as Kasparov, unfortunately. In Round 8, though, he has Black against Wesley So, which might be the last chance to stop the reigning champion cruising to a repeat win. Anand faces Mamedyarov in his last game with the white pieces before he has Black against Caruana in the last round. Oh, and before we forget, Rauf Mamedov will celebrate his 27th birthday on Friday with Black against Magnus Carlsen. If the interpreter can be believed, he said that was a nice present, but he wouldn’t mind $2 million instead!